Welcome! We’re so glad you’ve brought your family to First Unitarian. Choosing a spiritual home for yourself and your children is an important decision. We hope you find that home here, and we look forward to getting to know you. Our mission covenant calls us to nurture the spiritual and religious development of our members, both young and adult, through enriching and stimulating programs that speak to the central issues of life. As Unitarian Universalists, we have no creed or doctrine and are open to the wisdom of all the world’s faiths. We affirm the worth of all beings, and encourage each other to be kind and responsible, embrace our individuality, and search for truth and meaning in our lives. First Unitarian provides a warm, open, supportive community within which our children can learn and grow. Our program teaches personal values, ethical living, UU principles, and the varied sources of our religious heritage. UU religious education gives kids a framework to develop their own spiritual selves among friends and caring adults. Infants, toddlers, and preschoolers are cared for by trained and paid nursery staff; all other classes are cooperatively taught by enthusiastic volunteers from the First Unitarian community. 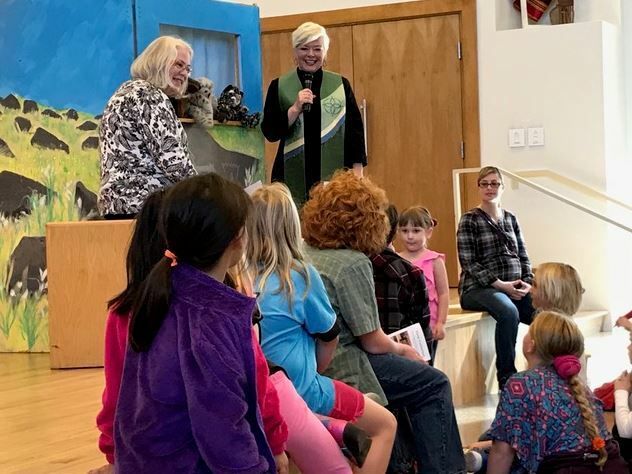 Faith formation and a connection between RE and the Sanctuary is fostered by Children’s Chapel, a child-centered service held in the RE building once a month, and attendance in the Sanctuary for all-ages programming once a month. There is no fee for the Sunday program. However, registration is required for all participants. Registration allows us to properly plan, staff, and fund our RE and childcare programs. Information and registration forms are always available on Sunday mornings in the RE foyer and at the Connections table in the Sanctuary foyer. We care about the safety and welfare of our children and youth. Our RE staff and volunteers undergo background checks in order to work with children, and we maintain a “two adults at all times” safe church policy during all RE activities and classes. Develop social inclusiveness skills and feel a part of this church community. Have practical experiences that relate to UU principles, expanding and enriching their daily lives as they grow towards adulthood. Learn to incorporate UU beliefs into their personal beliefs and learn to express those beliefs. Learn to respect and appreciate the faiths of others. Develop a spiritual foundation to take on their life’s journey. A nationally acclaimed, lifelong human-sexuality curriculum developed by the Unitarian Universalist Association in partnership with the United Church of Christ. First Unitarian OWL classes are taught by trained volunteers to age-appropriate groups of children, youth, and adults. First Unitarian has two cherished and energetic youth choirs. Our younger choir, the Spirit Singers, is for kids in grades K-5 and is directed by certified elementary music teacher Tania Hopkins. Our older choir, the Glowing Flames, is for youth in grades 6-12, and is directed by musician Micah Boutillier. Both choirs welcome new members. Rehearsals are held during the school year on the 2nd and 4th Sunday of each month from 12:30 – 1:15. The choirs perform in worship several times throughout the program year. For more information, contact the Religious Education office at 884-1801 or readmin@uuabq.org. UU kids love Summer Camp; many remember it as a highlight of their youth. Campers congregate for one week each July in the beautiful Sacramento Mountains near Cloudcroft. In the summer our high-school students take a break from Sunday classes, getting together on Wednesday nights instead for a casual meal and community building. Each spring we offer Coming of Age classes to our eighth graders as they prepare for high school. Coming of Age students learn more about UU’ism and themselves as they prepare “This I Believe” statements and lead a service for the entire congregation. The annual holiday pageant and parties, intergenerational dances, regional conferences, social-justice training, and other leadership and outreach opportunities round out First Unitarian’s RE program. Our Religious Education program is a cooperative. That means we need YOU! We request that everyone with a child in the RE program make a volunteer commitment each year. There are many ways you can help out, from occasional special events to once-a-month playground supervising to weekly classroom teaching. Every volunteer is important, and we value every minute donated to the program. You need not be an RE parent to help out. Interested? Check out the “Religious Education Volunteer” brochure for more information.